'12 Green presidential candidate, who may run again, calls crash reaction "disgrace"
Physician and 2012 Green Party presidential candidate Jill Stein came to the Capitol on Tuesday to press for a broad platform of progressive causes, with one in particular: calling on the state Department of Environment Conservation to declare rail shipments of crude oil to be an "imminent threat" and "clear and present danger," thereby shutting them down. "These are essentially weapons of mass destruction that have been regularly detonating every seven to 14 weeks," she said of the shipments coursing through the state from western oil fields. 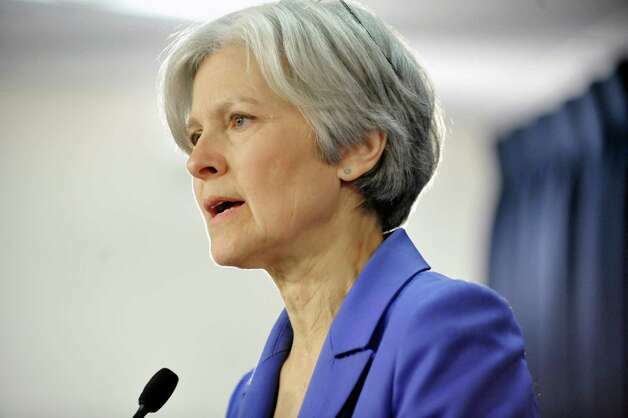 Using the term "comb trains," Stein said it was "astonishing ... a disgrace" that federal action hadn't followed in the wake of the 2013 Lac-Megantic disaster in Quebec that killed 47 people. Albany County Executive Dan McCoy, who has called attention to the risks of the oil trains passing through populated areas on their way to the Port of Albany, attended Stein's press conference but didn't take part in the proceedings. Stein, who managed to get almost a half-million votes during her 2012 presidential run (or roughly one-third of 1 percent of the popular vote), noted that the more long-term threat to public safety came from the fossil-fuel system that the burgeoning oil shipments are just one part of. Stein's platform calls for the nation to mount a crash program to move to a "wind, water and sun" green-power economy by 2030. Stein also managed to drop in references to several other topics that have New York progressives up in arms at the moment, including the education reforms passed in the just-enacted state budget. "When other mainstream presidential candidates test the waters, they go behind closed doors to see what kind of money they can raise," Stein said. "When we test the waters we are reaching out to frontline communities to see if we can serve the causes and the justice they deserve." How is it that some one like Dr. Jill Stein understands the threat of the oil industry and the bomb trains, but our NYS government does not. If Dr. Stein supports green energy, she has my vote and support.